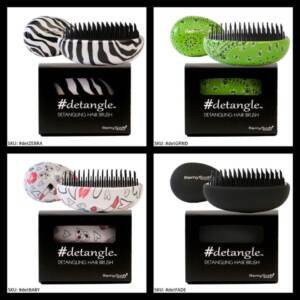 A good detangling brush is an essential part of quality hair care. Even if you use the best in quality hair care, tangling can still be a serious issue. If you’re tired of causing breakage when pulling your brush through your tangled mane every morning, it may be time to consider a hydrating shampoo and conditioner, such as a sulfate free shampoo and conditioner. These tips will help you keep your hair from tangling and will ensure you can safely and comfortably remove any tangles that may occur. If you are transitioning from hair extensions back to your real hair, tangling often occurs at the point where your hair extensions meet your natural hair. Unfortunately, this is also the weakest point, which means if you simply pull your brush or a comb through the hair, you are more likely going to break out the extensions and the ends of your hair in the process. Instead, first separate as much as you can with your fingers and then gently pull a comb through the remainder. Never pull hard. One of the questions many people have regarding detangling is whether they should do it when their hair is wet or dry. The answer is it depends on the condition of your hair. For most people, removing tangles immediately after washing with a sulfate free shampoo and conditioner is best. However, if your hair experiences excessive damage or shedding, it may be best to detangle your hair with a quality detangling brush before you wash it. Coconut oil or conditioner can be used on dry hair to help make the process go more smoothly. Perhaps one of the most important methods of detangling your hair is to exercise patience in the process. When your hair is difficult to manage, it’s easy to become frustrated and just start pulling until the knot disappears. Unfortunately, this causes serious damage to the strands. Always make sure you have plenty of time to dedicate to your hair to prevent the need to rush. Detangling isn’t anyone’s favorite activity, but it’s a necessity if you want your hair to be beautiful and healthy. Thankfully, you can take steps to prevent tangling so you can spend more time on styling your hair and your other daily activities. Cutting your hair no less than every three months can help prevent tangles. Sleeping on a silk pillowcase or with your hair wrapped in a silk headscarf can also reduce tangling incidents. Finally, be sure you’re using a high-quality hydrating shampoo and a detangling brush to protect your strands. Tangling can not only cause you pain, but it can also cause serious damage to your hair. For this reason, it’s important to learn how to use quality hair care and a good detangling brush to prevent tangles in the first place and remove them when they do occur. With the help of a sulfate free shampoo and conditioner, you will be able to create beautiful styles that aren’t marred by tangled or damage hair. If you’re looking for a great hydrating shampoo to help you detangle, contact us. We carry a full-line of quality hair care products for all hair types.